...Const. chairman accused of embezzlement Dormaa Ahenkro -- Rumpus and rancor in the ruling New Patriotic Party continue to pile up between ranks and file of the party. Some of this bitterness in the party could be partly attributed to either lack of transparency or power sharing among the leadership. 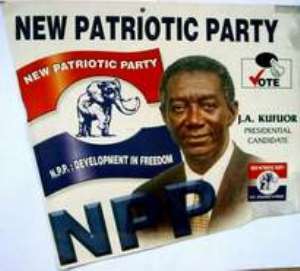 The Dormaa East constituency of the NPP is one of the areas where the party has been divided into three, each with a gang leader. The Chronicle investigations in the constituency revealed that the constituency chairman, Mr. Atta Amponsah who is said to be supported by Nana Emmanuel Duku, DCE for Dormaa has divided the front of the party, following his inability to render accounts to the party. Mr. Amponsah, who is also the Head of Language Department of the Dormaa Secondary School, according to our investigations, has embezzled ¢23 million of the party. Pressure from the Council of Elders and concerned party members on the chairman to render accounts proved futile. Last Sunday, March 14, a meeting summoned by the Council of Elders had to be postponed indefinitely. This development in the party, according to one of the elders, was alarming. Another factor that was facing the party in the district was the violation of the party constitution by the chairman. The chairman, according to our information, is bent on contesting the Dormaa East seat, thereby using the party resources to campaign for himself. This attitude of the chairman is fueling the division, as most of them are calling for the resignation of him. Another allegation against Mr. Amponsah was that he had been using party funds on funerals. In an interview with Mr. Amponsah on the alleged embezzlement of the party fund and demand for his resignation, he contended that he had not embezzled anything as was being speculated. He said, recently, he had announced that, since the NPP came into office, the only money they had in their coffers was ¢23 million and this money, according to him, was made solely by the DCE, Nana Duku. He told the paper that when the party won power, they were made to understand that the MPs, DCEs and the ministers had to support the party, but surprisingly, the MP for Dormaa East and the Deputy minister were doing nothing to keep the party going. According to Mr. Amponsah, he announced the scanty amount during the constituency fund raising on the February 28, just to ginger Hon. Kwaku Agyeman Manu and the MP to give out money. He further explained that, the ¢23 million he mentioned was not physical cash, but expenses incurred and paid by the DCE. On his inability to render accounts to party members, he said the treasurer, as at the time of the fund raising, could not render the final accounts of the party and the figure he gave was not specific. He told The Chronicle that the account of the party was red as at July last year. On the question about his contesting for the Dormaa East Constituency, he said he had not announced it officially, but stated that he nursed the ambition to vie for the seat. Mr. Amponsah said the reason he did not want to announce his intention to contest, was partly due to the provisions of the party's constitution, which demanded an aspirant resigned from one's position before contesting.